The Marshall McLuhan-Northrop Frye Matrix represents visionary legacies of insight into the global theatre, electricity, imagination and identity, and a quickening search into the future, where the “medium is the massage” joins with “the great code”. This presentation appreciates the seers who discovered pathways to recognizing present patterns and manifestations, and then moves on to see how these ideas and perceptions are shaping a 21st Century poetics. They spoke of Closing Time, a prophetic awareness inspired by their readings of the metamorphic, associative Finnegans Wake. Electric Processing and Imagination together form the recognition that our crossroads is both a Closing Time and an Opening Time: an evolutionary hyperdrive–where paradigms break down and new forms of consciousness emerge, where terror and fear simultaneously surge with visions of higher forms of consciousness and keener hearts. The closings we see in raging phenomena like the Brexit, xenophobia, the rise of Trump and Putin; the openings we see in the desire for people and ideas to cross barriers and boundaries, in the compassionate welcome to others and a creative inventive now. 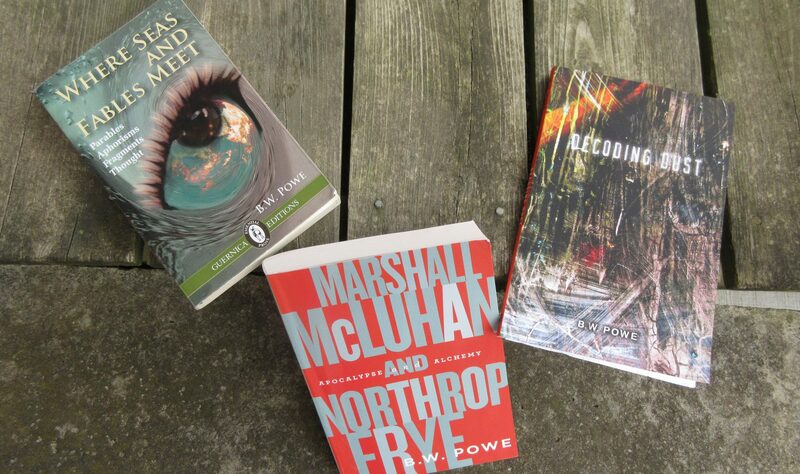 Our new Mysteries are jolting,mythically immersive, severe and ecstatic. This carries the imperative of perceiving that primary shifts are now happening in awareness and sensibility. Beyond ideology and theory, we´re experiencing immediacy and trancendence, darkening and illuminations, the closing of minds, openings of the soul. Can we sense what higher and lower frequencies are beginning to play out? B.W. Powe is a poet, philosopher, storyteller and essayist. An Associate Professor of English Literature in the Department of English at Toronto’s York University, he teaches courses on visionaries and the legacies of McLuhan and Frye. He was affiliated from 2011 until 2016 with the University of Catalunya in Barcelona, Spain, where worked on a virtual project called Opening Time: On the Energy Threshold, with Cristina de Miranda Almeida and Matteo Ciastellardi. His newest works are Decoding Dust (poems and dramatic monologues) and The Tigers of Perception (a multi-media lyric essay). This entry was posted in Sin categoría on 20 July, 2016 by bwpowe.